I’ve always enjoyed low-key films, plays and dramas where the plot, dialogue and story work in conspiracy to tell a brill story (not keen on the big blockbusters.) I’ve seen loads over the years and they’re often tucked into an odd hollow in the television programme schedule - a Sunday afternoon on BBC2 or at midnight on ITV. In the seventies Alan Bates was spread among many of them and I can well remember him in the "kitchen sink" drama A Kind of Loving. He was a jobbing actor and wasn’t one for giving interviews in The Radio Times or doing chat shows to push a new release. He was like Derek Jacobi or Alex Guinness - someone born to act and going to college or University was a waste of time. 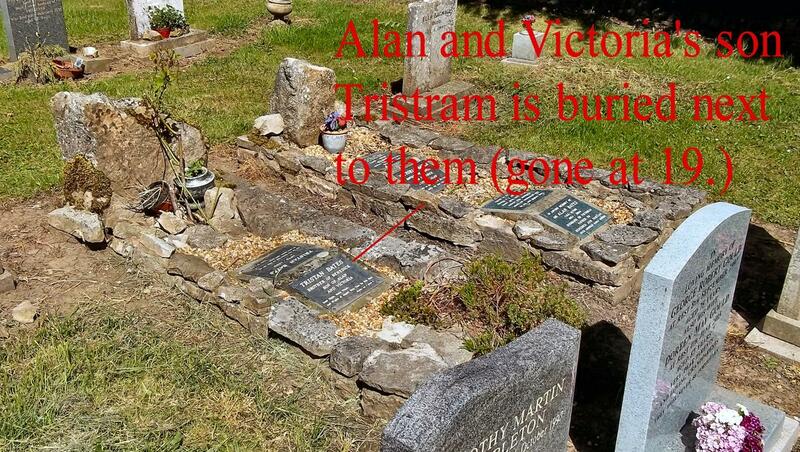 I found Alan’s grave tucked behind a beautiful church in a quiet Derbyshire village called Bradbourne. I’d never heard of it but the Sat Nav knew of it and it off my through narrow hedge-lined lanes that sliced through sprawling countryside. Suddenly I was turned out at war memorial on a quiet lane. Mrs Sat-Nav announced I had arrived. I listened to the end of a play on the wireless then got out of the car to check if the telephone in the red phone box (model K2) worked - it did. Some farmers taking a muck-spreader into a field looked at me oddly but nodded. An Agatha Christie-look-a-like lady was trimming flowers in front of a cottage but did not look up as a scuffed gravel. I strolled round the back of the handsome church - so handsome your dead bones don’t end up lying by it by accident. The Bates must have decided on this plot - Alan is here, his wife and a son. Alan was born not far from the grave in the Queen Mary Nursing Home, Darley Abbey. He was the oldest of three brothers. Where did the acting come from? His mum was a housewife and a pianist and his dad an insurance broker and a cellist. Both encouraged him toward music but aged 11 Alan was determined to be an actor. They sent him for dramatic coaching instead. He soon gained a scholarship to the Royal Academy of Dramatic Art in London but the call-up paper arrived and he had to join the RAF. He was just treading water waiting to get out on stage. His first stage debut was at aged 21 in Coventry and he was on stage in “big London” by 22. Aged 26 he did his first film role in The Entertainer opposite Laurence Olivier. His list of roles is half a mile long and too long to mention here but I can remember seeing him in the 2001 film Gosford Park and wondering where he’d been for a few years. Sadly when I watched it on DVD Alan was dying. He acted in the 2004 TV film Spartacus but died before it premiered. Though Alan’s dark demeanour leant him well to play the part of a ‘ladies man’ he was hotel/motel (bisexual). He had a relationship with the Olympic skater John Curry (who died of AIDS in Alan’s arms.) In his later years his companion was a lifelong friend actress Joanna Pettet and they lived in homes in New York and London. Aged 69 he had a hip replacement but had barely recovered when he was diagnosed with pancreatic cancer in January 2003. He was knighted later that year but by December he had suffered a stroke, slipped into a coma and died. There was only one war grave in the cemetery, a 20-year-old lad with a sentinel poppy. I did a hearty salute before walking back to the red telephone box. I took a pic and might paint it. Back at the car Miss Marple was still pruning her roses. Old villages like this normally have some punishment stocks. Over the hedge I asked Agatha if there were any stocks but she looked confused. “Stocks…where people had rotten apples thrown at them. I don’t she had her hearing-aid in. Check out the Saxon stone on the right….